Congratulations to the Oregon Student Nurse delegation attending the NSNA Convention in Grapevine, Texas on their successful actions to pass their Resolution in support of a National Nurse. The importance of the Oregon student's groundbreaking resolution was underscored when the NSNA President introduced both the President of the American Nurses Association and the President of the National League for Nursing. These three leaders stood together as each spoke to present their perspective on the issues. The Oregon students' well articulated presentations coupled with the actions of these prominent convention leaders created excitement and generated much needed attention to the resolution. The unprecedented attention and all the activity resulted in revisions that assured successful passage of the resolution. These revisions included the importance of elevating the Chief Nurse Officer position in the USPHS, also supported by the National Nursing Network Organization. "We were amazed at the level of interest in this initiative and realized having the Presidents of the ANA and NLN in attendance emphasized the importance of this historic and much needed resolution, stated Kindra Scanlon, student in attendance. "It was flattering that they would take time to speak and assure acceptable language so that NSNA members could move the concept forward. Attending this conference was an eye-opening experience and a valuable lesson in how political action can result in consensus building. It is exciting to see progress being made towards establishing a National Nurse for prevention who will involve all nurses and improve health outcomes." We are proud of our students, the future generation of nursing! This week a resolution in support of endorsing legislation to establish the Office of the National Nurse, voted on and passed by the Oregon Student Nurses Association during their February 23, 2008 convention, is being introduced into the National Student Nurses Association House of Delegates. The National Nursing Network Organization is committed to making sure students in attendance who will be considering this resolution have the most accurate and up to date information as they make their decision to support or oppose. We continue our attempts to dialogue with stakeholders and to work towards consensus, understanding, and compromise. Our Board of Director’s current thinking is very much aligned with the Quad Council (ANA, ASTDN, ACHNE, and APHA) and members of the US Public Health Service and their concerns are being addressed. We believe that it is essential to strengthen and make the position of the Chief Nurse Officer of the USPHS more visible, and to not create an entity that would require new funding and possibly replicate services. Therefore, it is our recommendation that the CNO becomes the Office of the National Nurse. The title of National Nurse would give the CNO of the USPHS the authority, impetus, and recognition needed on a national level to promote prevention. This would also place a nurse in a leadership position to help educate the public about the critical role nurses play, not what the media chooses to portray. We have heard concern expressed about whether the ONN would use best evidence-based practices. This is assured as the Office will be filled by a ranking member and leader of the USPHS and will be located within the Office of Public Health and Science. Bastable, S. B. (2003). Nurse as educator: Principles of teaching and learning for nursing practice (2nd ed.). Sudbury, MA: Jones & Bartlett Publishers. Finally, there is fear of unintended consequences. For instance, if a National Nurse were established, would politicians and others perceive this individual in the healthcare arena as the sole leader for every nursing issue of the country? Would the National Nurse usurp the power and duties of the nation’s national nursing organizations and nurse leaders? The NNNO Board believes that although the CNO’s position would be perceived differently in that the National Nurse will be recognized as the point of symbolic national leadership for a new philosophy and cultural shift to prevention in US healthcare, the actual level of authority, duties and responsibilities held by the CNO will remain consistent. We do have an excellent example of an existing position within a decentralized healthcare system to examine, and that is the Office of the Surgeon General. Clearly, the OSG does not hold rank over the AMA and other physician led groups, but rather he has his own subset of goals and objectives to accomplish, just as the proposed ONN would have. This list could be easily expanded to include the National League for Nursing, the American Organization of Nurse Executives, The American Association of Nurse Attorneys and the remaining nursing organizations that so diligently and thoroughly compiled Nursing’s Agenda for the Future (2002). We propose representative liaison members of these organizations be structured as a formal "Advisory Board" to serve the ONN. It is true we cannot control every obstacle that might be on the horizon, but through dialogue and open and honest communication, we can find solutions for overcoming these. It is important that we are all clear that the Office of the National Nurse initiative continues to evolve, based on the feedback and suggestions we have received. It is therefore imperative that organizations seek out the most current information so they know what it is they are supporting or opposing. Prevention is in the forefront of the national debate on health care reform. Through the ONN initiative, nurses are saying they want to take a lead role in these efforts. Nursing needs to be proactive on this issue, not reactive. As report after report continues to be published about the demise of our healthcare system, let’s remember that the nursing profession has the power, the expertise, the knowledge, and the caring to shift the tide towards prevention and improve our nation’s health. Thank you to the National Physicians Alliance for their endorsement of the initiative to establish an Office of the National Nurse. According to the NP Alliance website, "The National Physicians Alliance was founded in 2005 by former leaders of the American Medical Student Association. Membership is open to all physicians who have graduated from a medical school accredited by the Liaison Committee for Medical Education or who hold a license to practice medicine in the United States." On behalf of the 10,000 members of the National Physicians Alliance, I am writing in support of HR 4903. The NPA affirms the World Health Organization's definition of health as a "state of complete physical, mental, and social well-being and not merely the absence of disease or infirmity." We believe that by re-titling the Chief Nurse Officer of the USPHS to be the "National Nurse" that more attention will be brought to the public health and preventive issues that are cornerstones of the nursing profession. The NPA looks forward to being part of the growing coalition that will make this initiative a reality. Please feel free to contact us for any assistance you may need. The NNNO strongly urges your support of the American Nursing Association's Dear Colleague Letter: It's Time to Invest in Nursing. 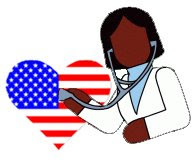 Representatives Lois Capps, RN (D-CA) and Steven LaTourette (R-OH), who co-chair the House Nursing Caucus have circulated a letter soliciting support for $200 million in fiscal year (FY) 2009 funding for nursing workforce development programs. If a large number of Representatives sign onto the Capps/LaTourette letter, nursing will be in a better position to receive this funding. The Deadline for Members to sign onto the Capps/LaTourette letter is today Friday, March 14. The ANA has also included a list of House congressional members who have signed on. Please visit this website to find your member of Congress and make sure they sign on to this important letter. It is time for nurses to UNITE around this very important issue! 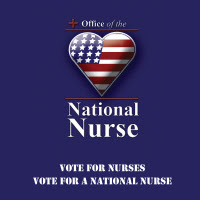 The National Nursing Network Organization is based on the principles of grassroots campaigning, and that means that each of you is capable of making a difference in educating others about the Office of the National Nurse Initiative. National Nurses Week is a great time to publicize this important healthcare policy. One way to do this is through a poster board. 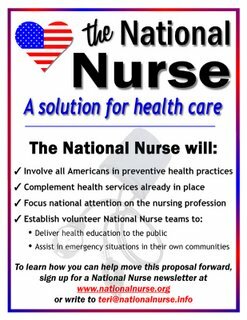 Consider including a Ways to Help handout to promote the efforts to establish an Office of the National Nurse. Have a laptop computer available and direct it to the National Nurse website. Have a contest with another facility and see who has the most signers on the National Nurse Petition. 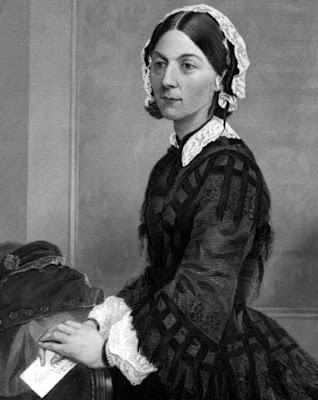 In 2007 we heard from several of you who made poster boards with the Office of the National Nurse as their theme and we hope many of you will do the same May 6-12, 2008 to honor Florence Nightingale, nursing's first political nurse activist. Kathy Palilonis RN BSN, Director In-Service Education at Immaculate Mary Home located in Philadelphia, Pennsylvania created this poster board in honor of National Nurses Week 2007. Meanwhile, on the other side of the country, Susan Sullivan MSN, PHN displayed this poster board in Orange County, California. To help in your efforts to teach others about what the Office of the National Nurse will accomplish, the team has created this free poster for your use. 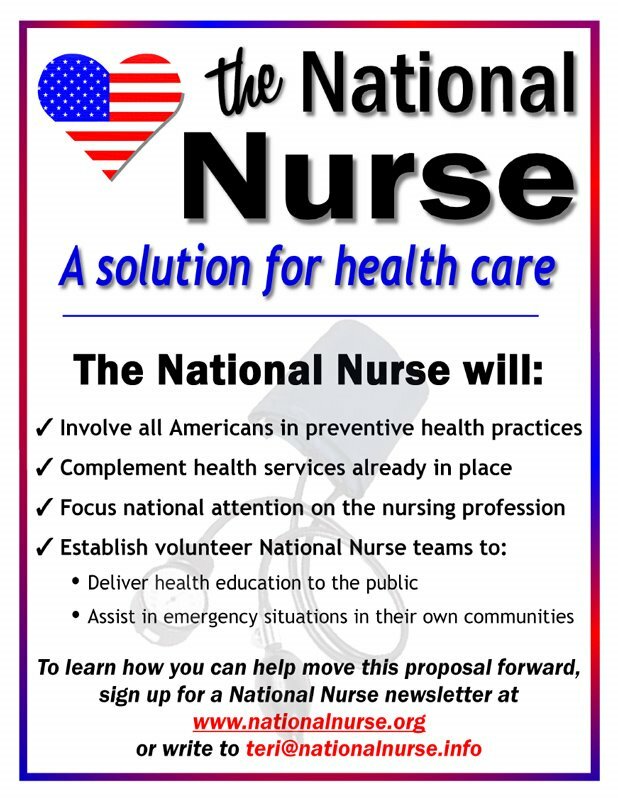 Please email teri@nationalnurse.info if you are interested in receiving this. Finally, there is a lot of merchandise for sale at www.cafepress.org/nationalnurse including larger versions of this poster, buttons, bumperstickers, mousepads, teeshirts and mugs. Proceeds from these sales helps to support the lobbying efforts of the National Nurse team, including payments for the website domains (the National Nursing Network Organization owns www.nationalnurse.org, www.nationalnurse.info, www.nationalnurse.net, www.nationalnurse.us) and the emailed newsletters. If you would rather send a direct donation to the campaign, click on the Donate Now button in the upper left hand corner of the screen. The Board of Directors thanks you for supporting the efforts to create an Office of the National Nurse. Wish you all Happy National Nurses Week! Thank you to the Kiwanis Club of Tualatin, Oregon for hosting a presentation about the campaign to establish an Office of the National Nurse. Members attending this meeting were troubled by the number of Americans who aren’t receiving accurate and understandable messages on how to take better care of themselves. Just last week, the Center for Disease Control published a report stating too few Americans know the five warning signs of a heart attack (pain or discomfort in the jaw, neck or back; feeling weak, lightheaded or faint; chest pain or discomfort; pain or discomfort in the arms or shoulder; and shortness of breath). This same study revealed that the number of Americans who know what to do when a heart attack is suspected (call 911 to get emergency help) was not as high as it could be. The Tualatin Kiwanis were also astute to the fact that Oregon and the country is facing a looming nursing shortage. They recognize and appreciate the value of having a National Nurse serving to attract others to the profession.